This morning ANZ announced its Banking on Australia program, in which it will spend $1.5 billion over the next five years to reshape its business and invest in digital technology, with the immediate launch of a range of digital initiatives. At the media event announcing the program at ANZ’s headquarters this morning I spoke about the future of banking, and ANZ Australia CEO Phil Chronican shared ANZ’s initiatives. I will try to write more later about what I covered in my presentation. For now here are some excerpts from ANZ’s press release on some of the very interesting statistics from a survey performed by ANZ for the launch, together with some of my comments. Power Retail magazine has just published a very nice piece on 3D Printing: The Next Retail Revolution, drawn primarily from an interview with me. Yesterday morning I appeared on the Sunrise national breakfast program together with science broadcaster Dr Karl Kruszelnicki, being interviewed about the big ideas and new technologies that will change our lives. The video clip is below. The cross-over between physical and online retail is not just for innovators and techies. It is the way people shop. 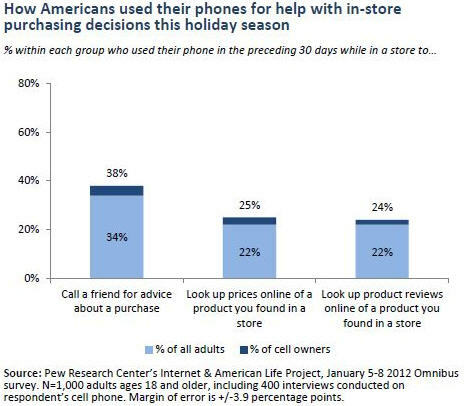 In a 30 day period spanning Christmas, 52% of Americans who have mobile phones (and who cares about the rest? 🙂 ) used mobile phones to help them make buying decisions, according to research from Pew Internet.